I'm not sure if this has been done. 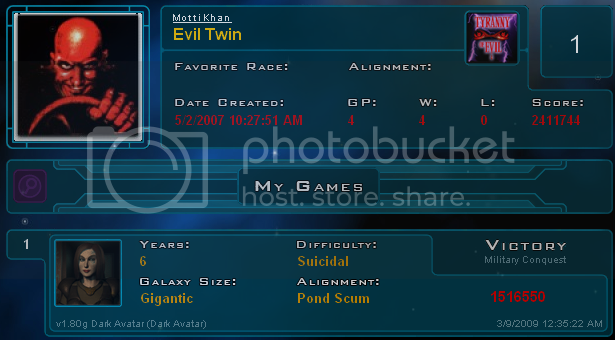 A thread to list those who have broken a million points in a GalCiv2 game. This isn't meant to be a top 10 or whatever, just a list of millionaires. In alphabetical order (by first name, if applicable). I'll update the op as people post their games. I'll start the list from memory. Even if you're already on the list, please post a screenie of a 1mil+ game. I should be joining the club by tomorrow. Gee I thought there were more than this, but there are multiples (Motti, CL, Livoyna and perhaps others). Anyway here's my DL game and I'll take the liberty of posting Mag's as well. Looks like its going to take another couple of weeks. My last DL game stalled out @ 985k. Getting 1M+ on DL is really pretty tough and requires a bit of luck to achieve. Keep at it and I'm sure you'll get there. How would you rate the current DL, DA, and TA in terms of difficulty in hitting the 1 million mark? In DA they introduced immense maps which have up to 1000 planets, double that of gigantic maps in DL but DA included changes reducing the economic output you can get from each planet. TA has the DA changes plus it reduced the focus (i.e., when you switch focus on a planet to military, society, or research) from 25% to 20% making the all-factories or all-labs strategy harder. TA introduces unique tech trees so through tech stealing/trading one could collect several bonuses not present in DL or DA. Actually, Immense maps were introduced in TA. DA's largest is still Gigantic, which can have over 730 planets. AFAIK, Immense maps in TA produce less than 600 planets though. I'd say that DL is the hardest as far as mega scores go. In fact, I'm not aware of anyone besides Mumblefratz who has been able to attain that score. DA would be the easiest in my opinion, which leaves TA in the middle by default. AFAIK, Immense maps in TA produce less than 600 planets though. Yes, same as Gigantic, which was downsized for TA. Gigantic/Immense in TA is 500-600 on scattered/loose whereas it's 700-800 in DA on scattered/loose. You're also correct about Immense being TA-specific. Your mileage may vary slightly, though, as I've wound up with a 499 (so close!) on TA Gigantic loose. If macro-managing 75%+ worth of 800 planets to crush what's leftover from a try at Influence means a Million score or more, i'll settle for a clear 250,000 points faster and at Peace, thank you for your kind attention(s). [e digicons]o_O[/e] Unless my wrongfully evaluated mathematics span a week (8 hours/day, or somethin' along those figures) worth of multiple clicks equally done for 10 points each. Where's a Governor when we need it the most. I hear ya. A little bit better draw on resources (only had 4 econ, 5 mil) would have put me over. Even with the resources I received I probably could have optimized my execution at a couple of key points and still made it. That said, I don't know that I have another DL game in me. I'd like to experience some of the cool new features (and massive scoring potential ) of DA but at the same time I feel as though I've got some unfinished business with DL. We'll see. Unless my wrongfully evaluated mathematics span a week (8 hours/day, or somethin' along those figures) worth of multiple clicks equally done for 10 points each. Where's a Governor when we need it the most. 250k for an Influence win is quite good. You bring up a good point, too. The game in its 3 iterations has a little something for a diverse group. Some of us enjoy competing for score and outdoing our personal best in that regard. There's the heavy modding ability that draws your ilk in and there's the fantasy or total emmersion that appeals to others. Pretty well thought out, don't you think? Pretty well thought out, don't you think? The sheer variety (or overly complex probabilities in scoring) makes it even more challenging for anyone trying to figure out this chaos. I can only respect (envy might be a better word!) people for finding the optimal ways of scoring perpetually better than competitors - until a "maximum" is discovered; if that's any possible. Metaverse away, boys. Too bad I-mod' MMV is still experiencing silly server troubles, though. Congrats Random! [e classic] [/e] I'm sure if you had played another game year, you would have got 1 million, but at that point 1 year for 15k doesnt seem like its worth it. Next game I expect you will break 1 milion. Congrats Random! I'm sure if you had played another game year, you would have got 1 million, but at that point 1 year for 15k doesnt seem like its worth it. Next game I expect you will break 1 milion. It's a common misconception that you can get any arbitrary score you want if you're just willing to extend the game the requisite number of years. That is definitely not the case. Very early in the game you are pretty much pegged to a curve that the game will follow and only something truly extraordinary can break you out of that path. Growth in all resource allocation games tends to be exponential because your growth rate is dependent on how much "stuff" you have. Get more "stuff" and you grow faster. That is in fact the classical definition of exponential growth. You start off early in a deep resource hole but as you accumulate more planets, more mining resources and technological bonuses then growth accelerates. Typically the game's scoring potential is pretty much fixed by the end of the second year if not earlier. You can see this when you get to the point that you can win the game and you begin checking the score at the end of each game year. The first time you do this forms your baseline. The next time you do this you get a value of how much the additional year was worth. Say as an example that at the first score check your score was 300K and then 1 year later you check and the score is 600K so that first additional year was worth an additional 300K points. Then the year after that you check again and you'll find that year was probably worth only 150K points. Each year the additional gain from an extra year approximately halves. So you can get another 75K and another 37K and another 18K then 9K, etc. By then it becomes pretty obvious. If you haven't made a million by then are you really going to do another year for 4.5K and another for 2.2K, etc.? By then it becomes pretty obvious. If you haven't made a million by then are you really going to do another year for 4.5K and another for 2.2K, etc.? Depends how close you are and how badly you want it. How close you are, yes. How badly you want it, no. It's an infinite sum dictated by the initial conditions. For example the following sequence asymptotically approaches 960K no matter how many years you extend the game or how 'badly' you may want it to reach 1 million. If you're on this curve then you're simply not going to make it, you need to be on a higher initial curve to have a chance. It's all dictated by that critical first year. Diminishing returns force everyone to give up sooner or later and you accomplish little by that last year. Why denigrate an otherwise great game by beating a dead horse right at the end? Other people can view things any way that they want but I've always viewed extending the game as "allowing your game to reach its full potential". No one achieves a 1 million point game by accident. No, but how long you're going to continue depends on how badly you want it, regardless of what the score turns out to be. I never said wanting it badly enough would get you there; just that it determines how much longer you'll stick it out. If it weren't for Mumblefratz, we wouldn't have ever found out that there is, indeed, a clear correlation between Turns, Years & Points. ZYW's might be fun and yet, there's always that creepy doubt that suddenly pops-in when you think you may just be on your ways to beat your best rankings. Here's the formula to me; Win or Lose. I might score less, but it doesn't make me any less efficient than listed Millionaires. I prefer conditions to results while they both last, you might say. In the meantime - Modding simply complicates the whole reasoning(s) to near infinitesimal figures, however strange that may seem to Metaverse compatible gameplays, uncheated and fair. This is what I was getting at. If that year 8 score would have put me over 990k, I probably would have tried to weasel my way over million even if it took 10-12 yrs. As it was, due to diminishing returns it looked like it was literally impossible to breach 7 figures, so I pulled the plug. As long as the subject has come up, Mumble, I'll throw this out...In your example above the yr-on-yr score increase was 50% of the previous yrs increase. The larger games that I have completed consistantly show this number to be in the 50-55% range. However, in this most recent game the yr on yr increase was less than 50% - first time I'd seen that. Any idea what the determining factor might be? The 50% mark is just a rule of thumb and is just an approximation. It depends on what is going on in the game. Once your population and income top out then there are no more dramatic gains left to be got in those categories and pretty much the only thing left is to continue spitting out ships for your military score but the support of those very ships cut into your ability to produce more ships at the same rate. Basically if you can keep one or more of the four components of score dramatically increasing then the rate of decrease is less, but once you're no longer able to dramatically increase *any* of four components of score then you get to that level of halving (or more) per turn. Perhaps in those games where the decline was less you were somehow able to keep levels of growth higher for a bit longer. It's not overly scientific it's just a matter of taking all of what that particular game will give you and to realize when it's time to call it quits. I think you'll see most of the 1 million point games in the 6-8 year range because that's when it's most effective to quit. When you've scored many hundreds of thousands of points who in their right mind is going to hold out for another 1 or 2K unless those few points are all you need to break some arbitrary goal like 1 million. Even then I doubt anyone would feel overly proud of a 20 year 1 million point game. Why bother? There's nothing shabby about a 950K game, just learn from it and try to better it the next time, don't try and turn it into something that it's not.